Your day in Mexico City will be full of fun with two memorable activities! For one low price you will have all-day access to the Six Flags Mexico theme park, plus 45 full minutes of swimming, kissing, and playing with our charming dolphin friends. This experience is one you won't soon forget! If you just can't decide what fun activities to do on your vacation in Mexico City, purchase this thrilling package. 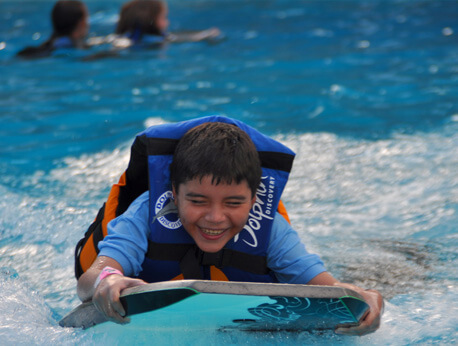 Join us at Dolphin Discovery Six Flags Mexico for a full day of memories with both a dolphin encounter and park admission for one low price! After a short briefing from our trainers, you will spend 45-minutes swimming and playing with our beautiful marine mammals. You can kiss them, hug them, shake hands with them, and even let them push you up and across the water with their heads on the soles of your feet. The dolphins' friendly smiles will put a smile on your face too. After your swim, check out the exciting rides including world class roller coasters, at Latin America's only Six Flags theme park. This family-friendly program is sure to help every member of your family make memories that will last a lifetime. This unique activity package will make you laugh, cheer, and gasp with delight on what is sure to be the best day of your Mexico City vacation. This unforgettable package costs just $140.75 per participant. This price includes your Dolphin Swim experience, lockers, showers, towels, and admission to the Six Flags Mexico amusement park. We also have wetsuits and life jackets available upon request. All children under 3'11" must swim with a paying adult. We only have three program times daily, so make your reservation now! Unfortunately, our programs are not available to women more than 5 months pregnant. If you are less than 5 months pregnant, you may participate with another adult who has paid to participate and by signing a responsibility form. We also ask that any sunblock used prior to this activity be biodegradable for the safety of our dolphins. Please arrive 30 minutes before your reservation in order to attend your informational briefing before your dolphin encounter. Kids shorter than 3’11” must swim with a paid adult. Wet suites available: Kids (size 6-16), ladies (8-14), gentlemen (s-xxxl).